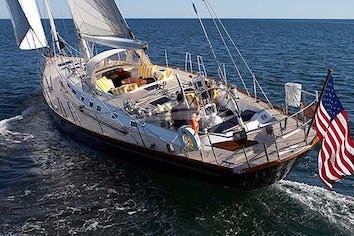 ARCHANGEL is a beautiful 69-foot Hylas designed by the renown naval architect German Frers. Six guests can enjoy true comfort in three spacious, well-appointed cabins. Each has seven-foot headroom and sound systems; the aft master cabin also has a flat-screen TV in addition to a center line king berth with custom 76" mattress. Other amenities include full DVD library, indoor audio system, iPod dock, satellite phone, satellite TV, kayaks, paddle boards, BBQ,deck shower, swim platform, and snorkeling gear. 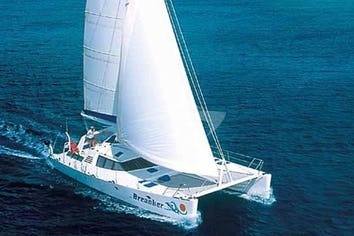 ARCHANGEL accommodates 6 guests in 3 cabins. The aft master cabin has a centerline king berth with custom 76" mattress, a built in bureau and vanity. The flat screen TV mounted on the forward bulkhead raises and lowers hydraulically. The master bath features an electric head, Corian counters and a large stall shower. The forward guest cabin has a double berth 76" long, a settee and tables. This cabin has an en suite toilet and washbasin and separate access to the stall shower shared with the port side cabin. The port side guest cabin has a queen berth 64" wide, 75" long. This cabin has its own head with an electric toilet and washbasin located across the companionway on the starboard side. It has its own separate access to the stall shower shared with the forward guest cabin. All three guest cabins have 7 foot headroom and stereos. The forward guest cabin has a TV. The main salon has 8 foot headroom and a TV - all TV's operate independently. Crew quarters with en suite facilities are located aft of the main salon. Having decided to pursue sailing as a vocation, Jim earned a USCG Master 100 Ton License and has held the position of captain in every job from the beginning of his yachting career. 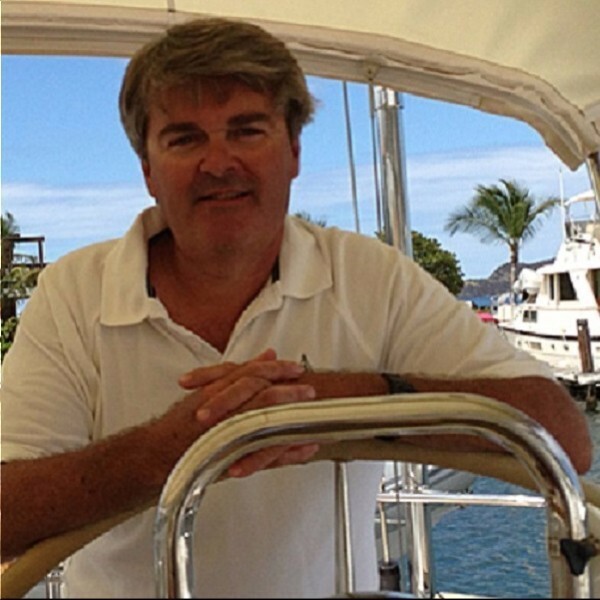 He has four years’ experience with term charters on sailboats from 53 to 70 feet in length, as well as skippering day charter yachts, both sail and power, in St. Thomas. 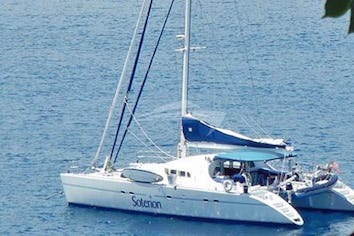 Most of his sailing has been done in the Caribbean and in New England waters – perfect experience for a charter captain. Gluten free and other dietary restrictions cheerfully and creatively accommodated.